Check out the new ‘Mentorship Program’, where interested alumni, parents or those in the community can share their love of theatre with the students. Did you know 1/4 of the student body at Bishop Chatard participates in Theatre? 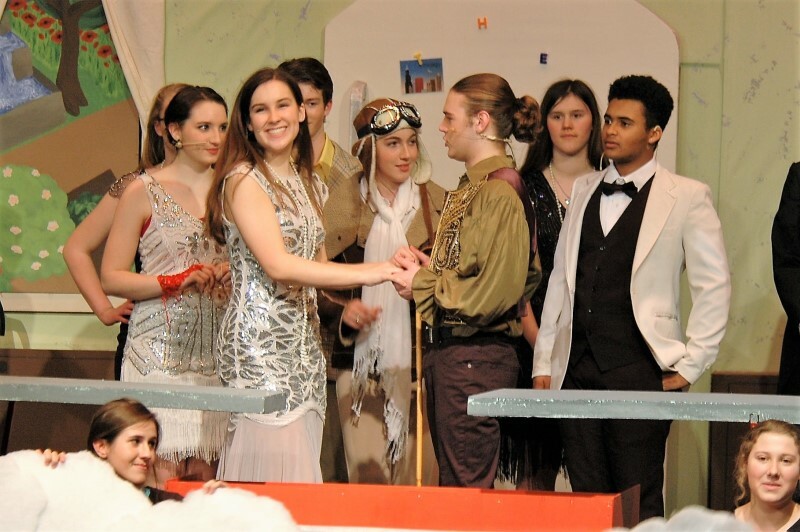 At Bishop Chatard High School, students take an active role in producing quality theatre productions. Students have the opportunity to audition for four performances a year. Students are not required to be enrolled in a theatre class to audition. Student productions are held in the Kyle Guyton Theatre — a black box style theatre opened in 2016 — or the main gymnasium. Auditorium-style seating transforms the gymnasium into a theatre setting for the Fall and Spring productions. Reserved seating for many BCHS productions is available via our website. Bishop Chatard High School is pleased to welcome Brianne (Bri) Lindsey, as our Theatre Director, beginning in the fall 2016! Bri graduated from White River Valley High School, Switz City, IN in 2000 and Indiana State University, Terre Haute in 2005 with a Bachelor’s of Science degree in Theatre. Bri moved to North Carolina where she taught high school theatre and dance for over four years while acting in local theatre and film projects. She also choreographed for Journey Productions and Cape Fear Shakespeare on the Green, where she also sat on the board. Bri completed her Masters of Fine Arts (MFA) in Acting at Regent University, Virginia Beach, Va. During summers, she is the producing artistic director at the Shawnee Theatre, Southern Indiana’s professional summer theatre company. The first play of the year, the Fall Play is usually performed in October in the main gym. It is a straight (non-musical) production. Cast size is normally between 8 and 20 students. Seniors have the opportunity to pair up and submit a published one-act play for performance. The duo then takes the role of director. They audition fellow students, create and run a rehearsal schedule, and direct the chosen piece. The One Acts are performed three times in a day in what has been lovingly called, “The Day of Ridiculousness.” Play submissions are due in September, auditions are held the Tuesday after the Fall production, and the One Acts are usually performed the first Saturday in December in the Kyle Guyton Theatre. All hands are on deck for the largest production of the school year. The musical auditions at the end of first semester and starts rehearsing the first week of 2nd semester. The musical is performed before Spring Break. Students interested in participating in the New Play Festival submit a new work, written by them in January. After being approved by a panel, the playwrights have the option to direct their own piece or interview a director. Similar to the Senior-Directed One Acts, students run auditions and rehearsals to produce the original works. Plays are produced the end of April or the first week of May in the Kyle Guyton Theatre. Join us and see how creative our student thespians are! Not an actor? Not a problem! 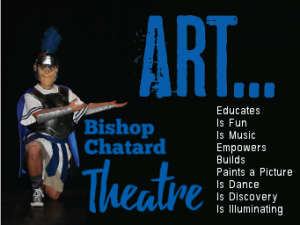 There are a variety of ways students can be a part of the Bishop Chatard Theatre Experience. To be a member of the Thespian Society, a student must acquire 10 points. Students can do so by being involved in Bishop Chatard’s two productions, the Fall Play and the Spring Musical, either by acting or working on the crew. We welcome anyone to audition or apply for a crew position! The Society tries to see an outside production at least once a semester. This and other shows outside of BCHS-sponsored activities also apply towards a student’s admission into the society. For more information about the Thespian Society, contact Theatre Director Bri Lindsey at blindsey@bishopchatard.org. Bishop Chatard launched its Speech Team in the 2016-2017 school year. The Speech Team season is October through February, with district and state speech competitions being held in March. The team competes every other weekend, usually within a 90-minute radius of Bishop Chatard. Students can compete in a variety of events. In addition to building a student’s public speaking skills, participation in the Speech Team supports confidence, critical thinking and researching skills. The Improv Team, formerly known as ComedySportz, participates in the ComedySportz High School League (‘short form Improv’) as well as other ‘long form’ Improv activities. Besides teaching teamwork and having fun, improvisation develops performance skills that can carry over in many life situations. Meetings are called as needed and posted online as well as emailed to our list of interested parents. If you would like to be on the Theatre email list to receive the latest updates and ticket sales info, please email Sheila Gramling, 2017-2018 Booster President, at sheilagramling@aol.com. Volunteers are what makes this organization successful! Throughout the year, we use Signup Genius to request parent volunteer help in providing time, talent or items needed to support the booster activities. Bishop Chatard is looking for adults willing to serve as volunteer mentors on the technical side of our theatre program. We need moms, dads, grandparents, aunts and uncles, or BCHS alumni and loving neighbors willing to give guidance and structure, to collaborate with student leaders and to be an adult presence on large group work days. Is cosmetology your profession or passion? Did you raise daughters with flowing locks or difficult curls? Or have you just been wearing make-up long enough that you are a self-taught expert? We need you! Is publishing part of your professional resume? Are you a fanatic about fonts? Have an eye for layout? Do you have a killer instinct for a split infinitive? Are you a History buff? We need you! Does your profession require an artistic knowledge or expertise? Did you study art in college? Are you one of those blessed people who have always been able to work magic with a paint brush? Is painting your hobby? Do you have tricks of the trade on perspective and color? Can you give insight into the right use of right tools? We need you! Are you employed in the visual media or recording industry? Were you a tech guy or gal in your high school or college theatre programs? Has your passion for photography or videography given you an eye for lighting? We need you! If you have no technical theatre expertise (that you know of) but would like to be more involved with the students and the production of our shows, we need you too! If you or someone you know would be a good mentor to help our program grow and flourish, or if you would like to know more about the time required for each mentoring role, please contact sheila gramling at sheilagramling@aol.com. Please note: All volunteers who work with students must pass the Archdiocese Safe and Sacred program and a school background check. Learn about BCHS Theatre, how a production is made and what students enjoy most as the BCHS Theatre Dramaturgy Team presents The Drowsy Chaperone video, produced for the 2018 Spring Musical.